You may have had a friend or client ask you to stitch their company or school colors on apparel using PMS colors. Typically, the mere mention of PMS strikes fear in the hearts of many. Here, PMS refers to Pantone Matching System and how it helps with color consistency in embroidery thread. Pantone is the international standard in color matching. 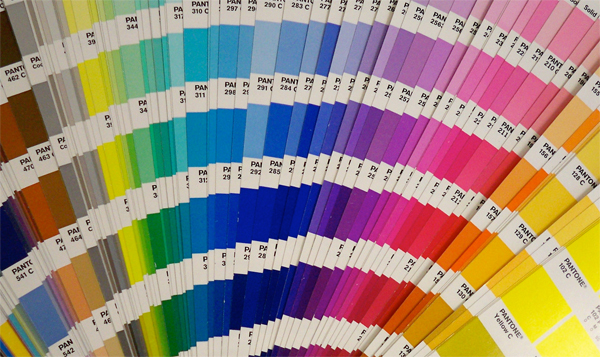 They started out standardizing colors in 1963 for the graphics and printing industries. Since then, they have expanded color matching throughout textiles and beyond. The idea is that colors appear differently not only to those viewing them but also across different mediums. One color can look much different on two separate computer screens. Printouts from any two printers can look far from the same. It is impossible to accurately reproduce paint or ink without a formula. With dozens of varying shades of the same color thread, there is no way to consistently match color without using Pantone's color matching system. Businesses use PMS colors in their logos and stationery to consistently represent their brand. It is only natural that they also want their apparel to match. Fortunately, most thread manufacturers provide PMS numbers for their threads. Another benefit to PMS colors for embroidery thread is that they help you get a better match when ordering another brand of thread sight unseen. Because it's impossible to accurately match colors onscreen, ordering a particular PMS color will ensure you know how it will really look without comparing the spool in your hand with the one you are ordering online. Incredible! It is important to have the right color for any project. With thousands of blues, it can be a challenge to do the one that is right for every detail!